Only what can be seen with full clarity can be treated optimally. This is why modern Endodontics are impossible without a microscope. The cleaning and preparation of the root-canal systems are the decisive step of any endodontic treatment. Cleaning serves to remove everything organic from the root-canal system – in particular bacterial by-products and toxins. Organic tissue, bacteria, and other toxic substances are dissolved in the entire root-canal system with special solutions. The root-canals are prepared using microscopically fine flexible stainless-steel files (some of them as small as 0,06 millimeters in diameter!). Leftover tissue is removed and the root-canal system thereby recovers its correct anatomical shape. Only then can the root-canal system be filled again. We use gutta-percha, a material related to natural rubber, for the filling combined with adhesive cement. 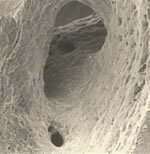 This technique, developed by Dr. Herbert Schilder, allows the filling to enter even the microscopically small and otherwise inaccessible parts of the root-canal system. Then the tooth is sealed with a composite material, allowing your dentist to carry out the rest of the work. Identification of extra canals with the microscope. 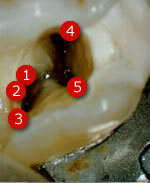 This example shows 5 separate root-canal orifices in a molar that usually has only 3 roots. Condition of the root-canal after correct treatment showing the fully cleaned surface of the root-canal as well as lateral canals. 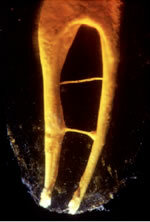 A filled root-canal system exhibiting its full complexity.